Reeds are the heart and soul of an accordion. Hand-made reeds (voci a mano) are known to be better than standard reeds (voci a macchina), but real information is hard to find. This article describes what they are, how they are made, and discusses the benefits. The author concludes that although hand-made reeds are expensive, they are worth their premium price. 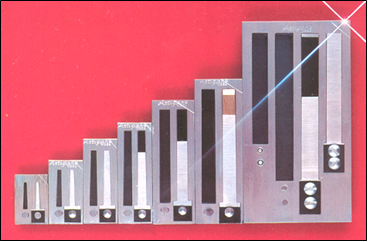 Accordion reeds are strips of metal that vibrate as air blows past them, and which make the sounds of the notes. Bigger reeds make lower notes. They come in pairs, one for each bellows direction, and each pair is riveted or, in the case of the really big ones, screwed onto a thick aluminium plate. The denser the plate the better, and brass or zinc plates have occasionally been used instead of aluminium. Normally the two reeds of a pair share a single plate which is pierced with two (or more) slots that exactly match the profile of the reed. 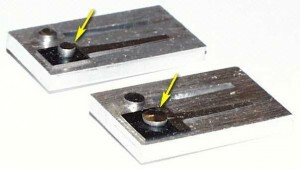 The latter are mounted on opposite faces of the reed plate and are free to flex in and out of the slot. And flex they certainly do – played loudly, a reed tip will flap over a distance of up to a third of its length. Reed-making techniques have been highly refined by skilled craftsmen for more than a century. Some of the requirements are fairly obvious but others are less so and different companies no doubt have their own traditional in-house methods. First you need really good steel. An accordion reed does a lot of bending (440 bends every second for middle A for example), yet the springiness has to remain constant for the life of the instrument. This means the steel must be highly resistant to metal fatigue. 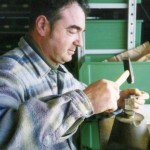 Artigiano Voci, a specialist reed-making company in Castelfidardo, Italy, use so-called ‘Harmonic Steel’ specially made for the purpose in Sweden. The air-gap around the edges of the reed has to be just right. Too big and air is wasted, but too small and the reed may grate against the reed-plate. Also the amount the reed protrudes above the reed plate is critical – too small and the reed is slow to start-up, too big and air is wasted. People who used to twang steel rulers on desks at school already know something about reeds. For example a flat ruler works fine, but one with a curled cross-section would be too asymmetrical to vibrate well. It’s the same for a reed. Punching them out adds edge burrs that spoil the flatness, so these have to be carefully filed away. Ruler twangers also know that rigid desks ‘sound’ better than small lumps of wood, and that unless the ruler is pressed very firmly against the desk the vibrations die away too quickly. It’s the same for a reed. The reed plate has to be massive relative to the reed and the rivet has to bond the reed firmly to the plate. Machines can do the basic operations of stamping, cutting, and riveting very nicely, and machine-made reeds (voci a macchina) are low in cost and satisfy many routine requirements. On the other hand, by doing the job manually, and with great care, you can make reeds that are better in subtle but very useful ways – ones that are especially appreciated by musicians. Hand-made reeds (voci a mano) are better than standard reeds in the following ways. They start to sound with a smaller flow of air, and can therefore make quieter sounds in a reliable way. They can handle a greater airflow, and produce louder sounds, without deterioration in sound quality. They need less air to produce a given loudness. Emilio Paolini of Artigiano Voci enjoys demonstrating the first of these points by inhaling through a reed using one nostril. A hand-made reed will sound nicely, but the trick is not nearly so easy with a standard reed. For a start, a wider range of sound levels injects more emotional excitement into the music. Secondly, reeds that need a kick-start are no good for brief notes – by the time they get going, their time may be up. This tends to happen mostly with the bassoon reeds. Thirdly, consider what happens when you play a quiet note or chord that involves more than one reed playing at the same time. Unless all the reeds start-up simultaneously, the beginning sounds ragged. Reeds that start with the merest breath of air are more likely to start together than are those that need varying amounts of kick-start. These factors explain why experts place so much emphasis on having the best possible reeds. Less experienced players may be happy with almost any reeds initially. But as skill and experience grows, the benefits become more and more apparent. Basically, voci a mano reeds give you the potential to play more expressively and more musically. But, of course, whether we can then play up to the quality of our reeds is a different question entirely. Hand-made reeds are made from the best materials, the reeds are physically larger, and the more critical operations are carried out manually by highly skilled craft-workers. 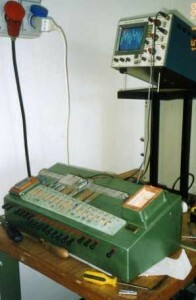 Emilio's lab test rig for reeds. The air pump is powerful enough to test a reed to destruction. As mentioned earlier, the objective is to bond the reed firmly to a relatively heavy and solid base plate. With hand-made reeds the plate is made from aircraft-grade hard aluminium alloy (Dural) to give maximum rigidity compared with normal aluminium used for standard reeds. You can tell the difference by dropping reed plates onto a hard surface. Dural rings with a higher pitch than aluminium. The plate for a hand-made reed also has its reed apertures polished internally to remove punching marks. This means the air-gap can be made narrower. Hand-made reeds are stamped out as a back-to-back matched pair from a narrow ribbon of the special ‘Harmonic Steel’ while standard reeds are stamped out in quantity from a sheet. After filing off the burr from the punching, the Siamese-twin reeds are separated and fixed with steel rivets onto opposite sides of the reed plate. However, unlike standard reeds, the riveting is done by hand in several stages. First the rivet is hammered just enough to hold the reeds quite firmly in position. Then the reed is aligned laterally and vertically in the slot with careful taps from a mallet. Since reed and slot have both been made with the same taper, the clearance on both sides can be reduced to any desired extent by moving the reed along the slot lengthways, provided only that the surfaces are sufficiently straight and polished. Once the correct position has been established, the top of the rivet is filed flat. It is then hammered face on to swell the shaft of the reed just enough to completely fill the rivet hole. At this point the ringing sound alters in a distinctive way. Any further expansion would distort the reed, so it is very important not to squash the rivet any further. Instead, the riveting is completed by hammering slightly sideways from all directions so that the rivet head becomes a neat convex dome. Next the reeds are pre-tuned to the correct pitch in a test jig by filing across the reed. Removing material at the tip raises the pitch, and removing it in the middle lowers the pitch. Score-marks across the reed caused by filing can act as sources of weakness that may cause a reed eventually to break when played loudly. So the final approach to the tuning point is carried out using a fine grade of emery board. Finally, to guard against corrosion, the reeds are polished with leather, and given a very thin coating of a special oil. 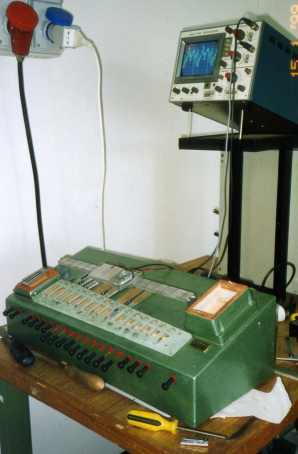 Final tuning is done by the accordion tuner after the reed has been fitted into the instrument. ‘Selected hand-made reeds’ are a further refinement. They are voci a mano reeds that have been ‘run-in’ by playing them loudly overnight using compressed air in a test jig. This helps to stabilise the materials so the reed will hold its final tuning better, and any reeds with hidden faults will break at this stage and can be discarded. To identify the type of a particular reed, first look at the rivet. On a standard reed the rivet is flat and squared-off, but on a hand-made reed it is domed. Then look at the side edges of the square blue area of steel that surrounds the rivet. On a hand-made reed the blue colour continues around the sides (but not the end). On standard reeds, the sides have the same silvery colour as the end, showing that it was cut from sheet not ribbon. After tempering, the less the steel is ‘worked’ the better, and this is why voci a mano reeds are cut from steel tempered in ribbon form. However the ribbon is expensive and the extra benefit is only fully realised with reeds mounted in cassotto, so reeds are also made using the same methods as voci a mano but from sheet steel. This saves about 50% in the cost of materials. Accordion makers Beltuna and Allessandrini told me independently that tipo a mano reeds are virtually as good as a mano reeds in the bass section of any instrument, and in the treble section of non-cassotto instruments but that in cassotto instruments a mano reeds offer a further slight improvement over tipo a mano. This may be because reeds within a sound chamber have to work harder because of the greater loading effect of the cavity. Well yes, the best reeds are expensive – after all we are talking about real craftsmanship and lots of man-hours. Even a single hand-made reed involves skilled and patient work, yet a 120-bass 5/5-voice accordion contains 530 of them. Beltuna told me that hand-made reeds are standard in their cassotto models, but other models are available with either hand-made or standard reeds. Choosing the latter can cut the cost of a new instrument by about 20%. So, should you save your money and compromise on your reeds? Most accordions in the world use standard machine-made reeds and they make many people very happy. However, the fact remains that a mano and tipo a mano reeds really do offer subtle, but real and important advantages for the discerning player at almost any level. My own answer to the question is a definite ‘yes’. I once tried two otherwise identical 72-bass accordions, one with standard reeds and one with hand-made reeds and I could definitely hear and ‘feel’ the difference. My advice is, if you have to choose, spend your money on the reeds not the rhinestones. Sincere thanks to Emilio Paolini of Artigiani Voci s.n.c., the staff of Beltuna Accordions s.r.l., and Antonino Allessandrini, all of Castelfidardo, Italy, for patiently answering the author’s many questions on this fascinating subject.